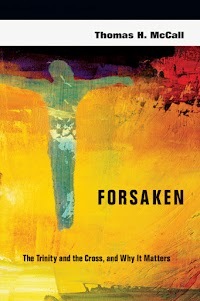 This post begins a series exploring the book Forsaken (The Trinity and the Cross, and Why it Matters) by Thomas McCall. For other posts in the series, click a number: 2, 3, 4, 5, 6, 7, 8. For a related post that looks at this topic through the eyes of multiple theologians, click here. Several years ago, I took Dr. McCall's class on the doctrine of God at Trinity Evangelical Divinity School. The primary focus was the doctrine of the Trinity, and a primary text was The Christian Doctrine of God (One Being, Three Persons) by Thomas F. Torrance. The class included thought-provoking discussions concerning various (and sometimes competing) theological perspectives on the Trinity. These discussions reinforced in my mind the importance of understanding the historic (Nicaean) roots of the Trinity doctrine - roots reflected in the aforementioned book and unpacked by Torrance in The Trinitarian Faith (for an article summarizing Torrance's view of the Creed, click here). In Forsaken, Professor McCall brings these historic Trinitarian insights into his analysis of Jesus' famous (but often misunderstood) words of dereliction on the cross: My God, my God, why have you forsaken me? (Mat 27:46 and Mark 15:34). As he exhausted his wrath upon the Son, the Father completely abandoned the Son. Jesus "became sin." Therefore the Father's wrath was poured out on Jesus. The physical pain Christ suffered in his passion was nothing in comparison to the spiritual and relational pain that Christ endured as he was separated from his Father. The eternal communion between the Father and the Son was ruptured on that fateful day. We should not understand it [Jesus' cry to God on the cross] to mean any abandonment of the humanity that Christ came to take on himself and to save. And we should not understand it to mean that the communion between the Father and the Son was disrupted or that the Trinity was any way "broken." We should, however, take the cry of dereliction as a powerful expression of the identification of the Son of God with us and our predicament. And we should understand it to mean that what the Father abandoned the Son to was death at the hands of sinful people. So while the abandonment is real, it in no way implies a loss of contact or relationship between the Father and the Son (p27). ...On the one hand we have a view - very common in contemporary Christian thinking - according to which the Father is against the Son; the relationship of mutual communion, love, and trust between the Father and Son is ruptured; and the Trinity is broken. On this view, the Father turns his face away from and utterly rejects the Son. This utter rejection, these contemporary theologians tell us, is good news. On the other hand, we have something very different; the deeply traditional view [of the Church fathers, and extending into certain medieval theologies] is this: the Father forsook the Son to his death, and he did so for us and our salvation. But even so, the communion of Father and Son is unbroken. And this too, the tradition tell us, is good news (p29). McCall challenges us to read again Jesus' words, and to find there the fullness of the gospel, which speaks of the union of God as Trinity, and our inclusion in that divine communion in and through Jesus' vicarious humanity through which he bears our shame and dies our death. He does this in communion with his Father, not in separation. I have to say that I am very encouraged that many in the evangelical/protestant world are ditching the penal subistution theory of the atonement and are discovering what the Eastern Church has taught, that Jesus didn't come to save us FROM the Father, rather, He came to save us FOR the Father. Our greatest need is to be rescued from Sin, Death and the Devil....not the Father. Certainly, there are truths contained in the Penal Substitution theory of the Atonement. However, it is so truncated in scope (as though Jesus dying for my sins is the sum total of the Atonement), that the theory is seriously flawed and thus does not accurately represent the gospel. Yesterday I spent the entire day researching atonement theories. My son and I have been throwing around ideas as to how God’s forgiveness works, and the various ideas held by various people, organizations, etc. If you think about it, there are several things that just don’t add up. For instance, how is it justice for anyone to take the penalty that is deserved by someone else? Why is it that God cannot forgive without restitution, when ordinary humans can do it? Are Jesus and the Father on the same page? If you do a search for “penal substitutionary atonement”, you will see that this is a hot topic of contention in Christian circles today. In fact, the doctrine of salvation by Christ’s atonement has never had anything more than theories to explain just how his death is necessary in our salvation. I guess there have been three or four big theories down through the centuries, but each has its weaknesses. I have found some very good material that I think you may find interesting. Check out this site: http://www.lastseminary.com/atonement/ and then select the paper titled: “Understanding Atonement: A New and Orthodox Theory” by Robin Collins. Some of the ways he discusses atonement make me suspect he has knowledge of Trinitarian theology. Hope you find it as awesome as I did! When you present a partial truth as a whole truth then you have made it into an untruth. Indeed; though, in humility, we would all need to confess that "we know in part." That being said, to seek to be faithful to the truth that is in Jesus (for Jesus, alone, is the Truth), is our calling as Christian teachers and preachers. In seeking this truth, we are helped greatly by the deliberations and writings of such Christian fathers as Athanasius, the Cappadocian fathers, and many others. Thankfully, in our day their is a resurgence in looking back to these roots of Orthodox Christian teaching, and authors like Thomas F. Torrance (and many others) are reliable guides in this journey of discovery. I have started attending a GCI church where I live. I have been in the Eastern Orthodox Church since about 2005 and frankly got tired of hiding the light under a bushel. Oh yes, the light is there to be found, if you know what you are looking for. Sadly, the only people we really convert are seminary students and clergy. It is rare to find an average Joe off the streets, but then evangelism isn't really high on the priorities list. Yes, Orthodox Churches have their outreach programs and usually it involves a "Greek food" or a "heritage festival". Other than that, most people didn't even know an Orthodox Church existed in their town. To me GCI is what I thought only existed in idea. An Eastern understanding of the atonement, and the zeal of an evangelical to let humanity know that God really is on their side. The struggle I have is what the GCI version of ecclesiology, but when I study Church history it does't really paint a very good picture. Seems that many Bishop's who stand is apostolic succession didn't use very good judgement in regards to human rights and state sponsored suppression of heretics and non believers. It seems there never were Bishop's willing to tap the emperor on the shoulder and whisper in his ear something along the lines of "Hey, you know the Lord really doesn't approve of you having the property of heretics confiscated. He also doesn't really approve either of the way you have been burning and drowning people because they don't agree with you theologically. Hey, I'm just saying." Yet, these emperors are sainted and Bishops, to this very day, take their names. Robert, I'm glad you're having a positive experience in a GCI congregation. We are on a journey together and learning much as we go. I'm glad to be travelling with you! C.Baxter Kruger has a very good explanation of this in Chapter 3 of "Jesus and the Undoing of Adam". Jesus' last words to the Father were "Father, into your hands I commit my spirit." There was communion with the Father to his dying breath.